Attention to the club’s finances was therefore a mandatory part of Wright’s job and he had no illusions about the Resolutes’ potential drawing power. On a recently concluded “Southern trip,” Boston’s share of the gate receipts for two matches with the Resolutes, including one played at Brooklyn’s Union Grounds, was a paltry $124.67, less than one day’s receipts with more competitive opponents.3 To make matters worse, the three coming matches were scheduled around July 4, a major holiday in the Boston area. Independence Day itself was of special concern because of multiple competing activities, including a rowing competition in the morning, a patriotic concert, and a sailing regatta scheduled for 2:30 in the afternoon.4 Trying to make the best of a bad situation, Wright decided to offer Bostonians two opportunities to watch base ball on a day when few people would be working, thereby creating the first professional doubleheader.5 But the games would carry separate admission charges, based on the perhaps questionable premise that anyone would pay twice in one day to see the Resolutes. Having to play the Resolutes in the first place was due to the National Association’s dubious practice of accepting any club willing and able to pay the $10 annual admission fee. As a cooperative club dependent on gate receipts to fund players’ salaries, Elizabeth had little financial wherewithal to upgrade its 1873 amateur roster beyond adding the Allison brothers, Doug and Art. 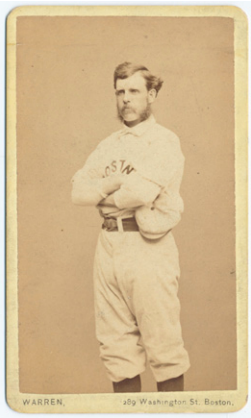 Both had reputations as “hard-core complainers,” which put them in good company with another Resolute brother combination, Hugh and Michael Campbell, also “renowned grumblers.”6 All of this negativity may have led the Red Stockings and their fans to overlook another fact about the Campbells. Only seven years earlier, the two had been part of one of the biggest upsets of the pre-professional period, the Irvington Club’s 1866 victory over the defending champion Brooklyn Atlantics. If those in attendance for the 10:00 A.M. first pitch thought the early start might beat the heat, they were quickly disabused of that notion; the Boston Daily Globe reported intense heat even in the morning. The Boston Daily Advertiser and the Boston Evening Journal agreed about the heat, but not about the crowd. The Advertiser reported a large crowd while the Journal wrote that attendance was kept down by the oppressive weather. The Advertiser also accused the Boston club of playing a “second-class nine,” but the only change appears to have been a game off for star shortstop George Wright, allowing old Cincinnati Red Stockings luminary Charlie Sweasy to play his only game for the Boston version of the Red Stockings.7 Not surprisingly, Boston’s ace pitcher, Albert Spalding, kept the Resolutes off the scoreboard in the first two innings, but the home team didn’t fare much better against Hugh Campbell, managing only single runs in their first and second at-bats. 1 New York Clipper, July 5, 1873: 107. 2 William J. Ryczek, Blackguards and Red Stockings: A History of Baseball’s National Association, 1871-1875 (Wallingford, Connecticut: Colebrook Press, 1992), 96. 3 Harry Wright Account and Notebooks, in Spalding Baseball Collection, Manuscript and Archives Division, New York Public Library. Astor, Lenox, and Tilden Foundations, New York Clipper, June 21, 1873: 90. 4 Boston Evening Journal, July 3, 1873: 2. 7 Boston Daily Advertiser, July 5, 1873: 4; Boston Globe, July 5, 1873: 1; Boston Evening Journal, July 5, 1873: 1. 8 New York Clipper, July 12, 1873: 117. 9 Boston Daily Advertiser, July 5, 1873: 4.